Will you vote (presidentialCandidate) or (anotherPresidentialcandidate)? A good friend from my hometown in Mindanao asked me through text (SMS). Unfortunately, he only mentioned two names. There are 9 presidential candidates to choose. Apparently, only the very popular candidates are usually mentioned. Because I know that he knows I am vocal on my support to one presidential candidate, I suspect he wanted to engage another lengthy campaign discussions. I think of another thing. I want to share to him about Vote God advocacy. So I replied: I will vote God on May 10! I just read fellow Cebu blogger’s post about election, Vote God this Philippine Elections 2010. Look to your conscience and choose the way of GOD! Do not just listen or even take the word of these aspiring public servants but instead do your research and I encourage you to use this L-A-S-E-R test as your guide. Another blogger who mentioned about Vote God crafted the striking truth when she wrote that deciding who to vote lies in our minds, hearts, and hands. Isn’t her post Let’s Vote God sounds equally intriguing as Vernon’s? Recently, I wrote and I asked, Do your candidates pass the LASER test for Election 2010? In that post, I mentioned about Vote God campaign by the Dilaab Foundation. Going back to my friend. As expected my friend exploded with quick reactions. Unsa na nga klase nga joke bai? [..] faith-impelled advocacy which hopes to infuse the electoral process with Christian values and for the discerning bloc to muster enough moral courage to choose good over evil, even the lesser evil, during the elections. It is choosing the way of God! I think you are also eager to know about Vote God. Instead of copying and pasting the Frequently Asked Questions about Vote God, I would point to you the primary source. 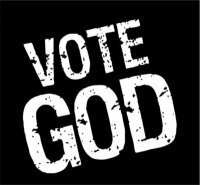 Please visit http://www.votegod.net. Philippine elections have always been intense political exercises. […] No other event can mobilize so many citizens in such a concentrated period of time as election can. [The] Philippine politics – the way it is practised – has been most hurtful of us as a people. It is possibly the biggest bane in our life as a nation and the most pernicious obstacle to our achieving of full human development. The Vote God campaign launched recently by the Dilaab Foundation serve as our guide on May 10, 2010. It calls us to take roles on the most intense political exercises we have in this country. Instead of hurting each other; instead of shaming each other; we can work together to make election the most pleasant experience for all of us. If you have seen the video I shared in An Election without Vote Buying, you have witnessed how the people in Calidngan in Carcar City, Cebu was transformed. Why they succeed? The reason is simple. The people in Calidngan choose the way of God. Together, let us take roles for a clean, honest, and peaceful election. Let us choose the way of God.